Emerald, one of the four precious gems, the green representative alongside with red ruby, blue sapphire, white diamond, is the birthstone of May and its rich green colour reminds us of spring and natural rebirth and renewal. Emeralds throughout history have been used as symbols of sincerity and kindness and they were the gemstone dedicated to the goddess of beauty, Venus. For millennia, they have been one of the most admired and sought after gemstones in the world. 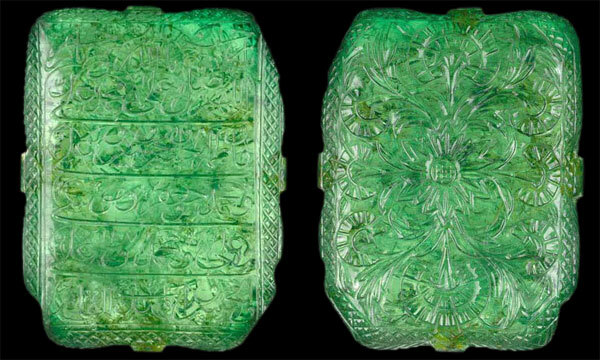 Though they adorned the Egyptian pharaohs and Roman emperors, emeralds achieved an exalted status when they returned to Europe in the 16th Century on the boats of Spanish Conquistadors from what is now South America. 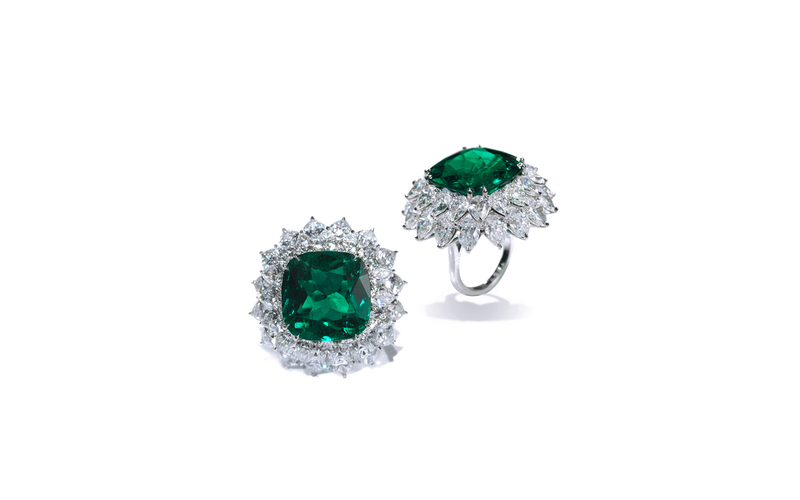 Emeralds were an indispensable elements for ornating sumptuous jewels of royal families, maharajas, kings, aristocracy. Some exceptional parures entered the history being never changed, maintaining their original aspect. Diadem of the Duchess of Angoulême Marie Thérèse of France is one of the few pieces of jewelry of the period that remain in their original state.This tiara was commissioned in 1819 by Louis-Antoine, the Duke of Angouleme for his wife Marie-Therese, the Duchess of Angouleme. The final work on the tiara was completed in late 1819 or early 1820. 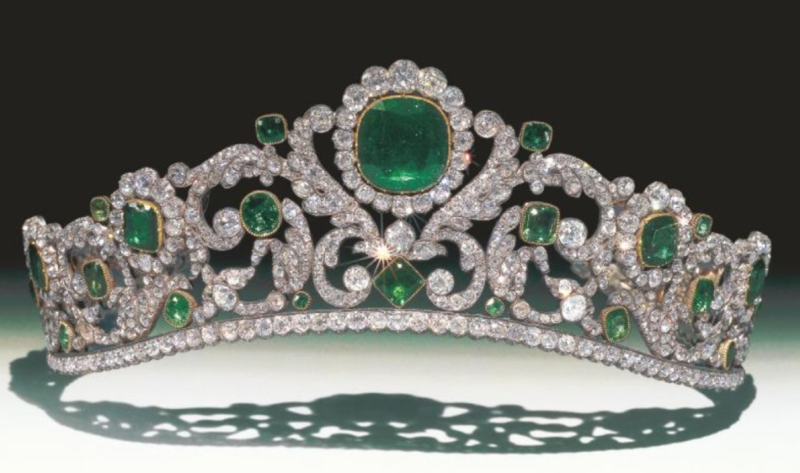 After a long list of owners the diadem finally became the property of the Louvre Museum, where it is displayed today.The tiara which was designed and executed by the French Royal Jewelers Evrard and Frederic Bapst in 1819, was a masterpiece of the French jewelry craftsmanship of the early 19th century. It is designed as a scrolling foliage mounted with a thousand of diamonds set in silver and emeralds in gold.The diamond-studded semi-circular band of the tiara, is curved upwards towards the center, in order to fit into the contour of the wearer’s head. The scrolling foliage of the tiara arises from the curved band, and the design is perfectly symmetrical with respect to the median line. Two emeralds are placed along the median line of the tiara, a lower small square-shaped emerald touching the lower curved band, with its opposite vertices along the median line, and an upper larger cushion-shaped emerald as the centerpiece of the tiara, surrounded by 18 brilliant-cut diamonds. Twelve other larger emeralds are also placed in symmetrical positions, six on each side of the median line of the tiara. 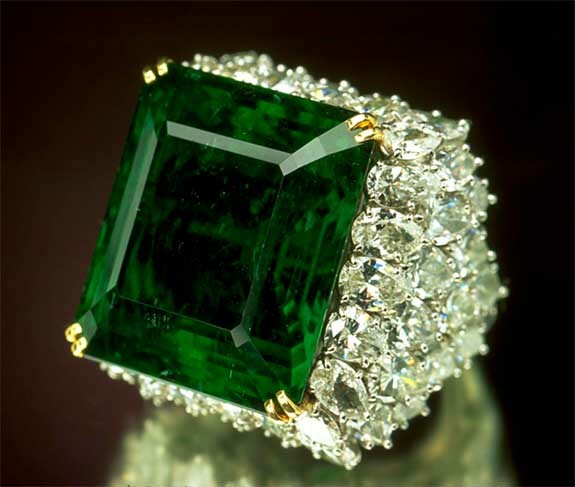 Moghul emerald, is considered to be one of the unique specimens ever existed. According to long traditions, Indian rulers, appreciators of gems and jewelry, believed they bring luck. It represents an elegant Arabic script with a Shi’a Muslim prayer from the front side, on the reverse is a naturalistic floral carving design of a rosette surrounded by poppies,being never belonged to an Indian Muslim ruler but to one of his officers.The gem itself is believed to have been mined in Colombia. It was sold at auction by Christie’s of London in 2001 for $2.2 million. One of the most breathtaking suites of emerald jewelry in existence is the Seringapatam Jewels, which is housed at the Victoria and Albert Museum in England. 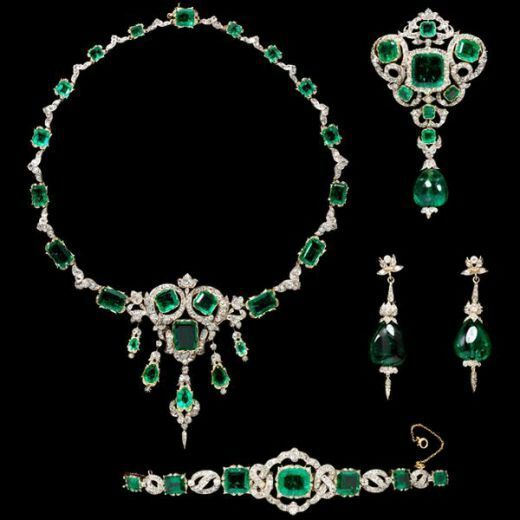 The ornate set consists of a necklace, brooch, bracelet, and pair of drop earrings made of emeralds, diamonds mounted on gold and platinum. 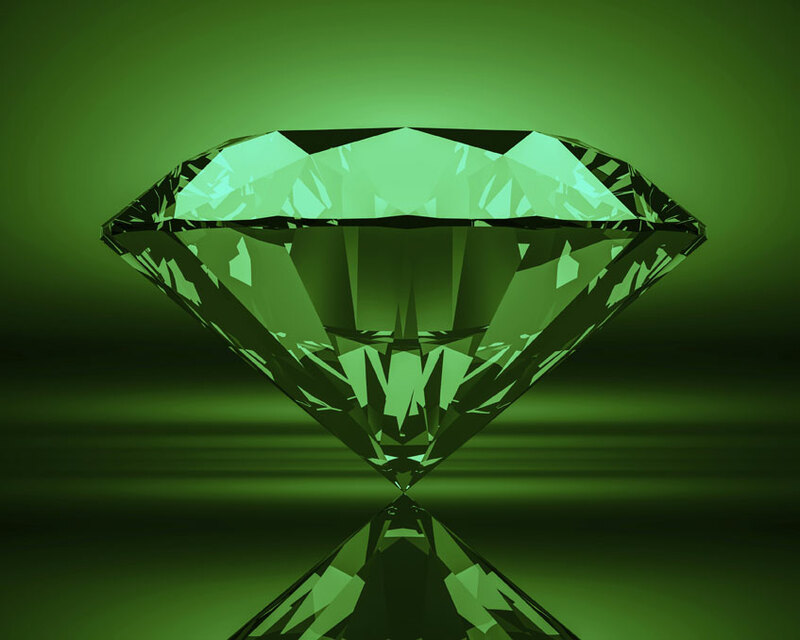 The emeralds were originally a reward given to British Major-General George Harris, following a victory at the Battle of Seringapatam in India in 1799. The emeralds remained in the family, and were eventually set into the spectacular suite of jewelry for the wife of the fourth Lord Harris, Lucy Ada. The gems were made into jewelry over a period of years, beginning with their marriage in 1874 and continuing until 1887. Nowadays, emeralds are highly appreciated and used by independent jewellery designers and prestigious Maisons. Being faceted in different ways, or used as cabochons, it takes part of both classical jewels and modern, edgy pieces. 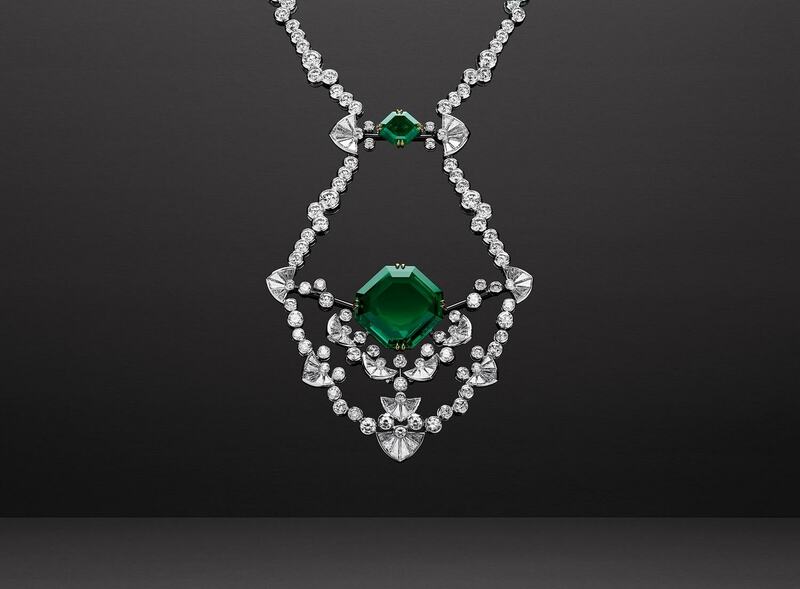 Mumbai-based Viren Bhagat creates truly captivating jewellery inspired by his native India and Art Deco, ingeniously mixing carved and various shape emeralds with sparkling diamonds. 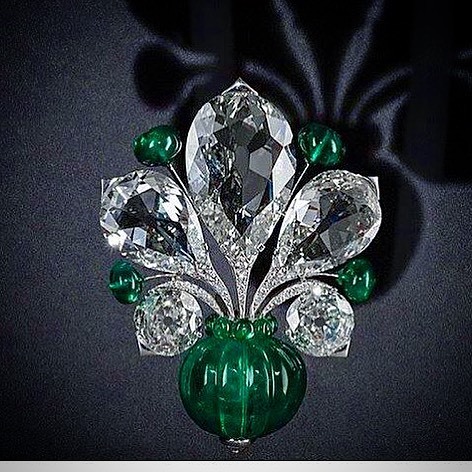 An Emerald and diamond brooch by Viren Bhagat, pure expression of Indian style, visually refers us to jardinier brooch, so in vogue in the 1920s during Art Deco period. Beautifully carved emerald is presented as a delicate vase which helds original flower composition made of three sparkling rose cut diamonds, graciously alternated with emerald beads, which looks undoubtedly exquisite and dainty. A refined sense of contemporaneity exhibits high jewellery by eminent French Maison Reza. In “Dentelle” necklace created by Olivier Reza, actual head of the house, simplicity of a jewel is closely alternated with complexity of forms and boldness of colors, perfectly centering Colombian and Zambian emeralds, beautifully supported by trapeze and round cut diamonds, set on white, yellow, black gold. 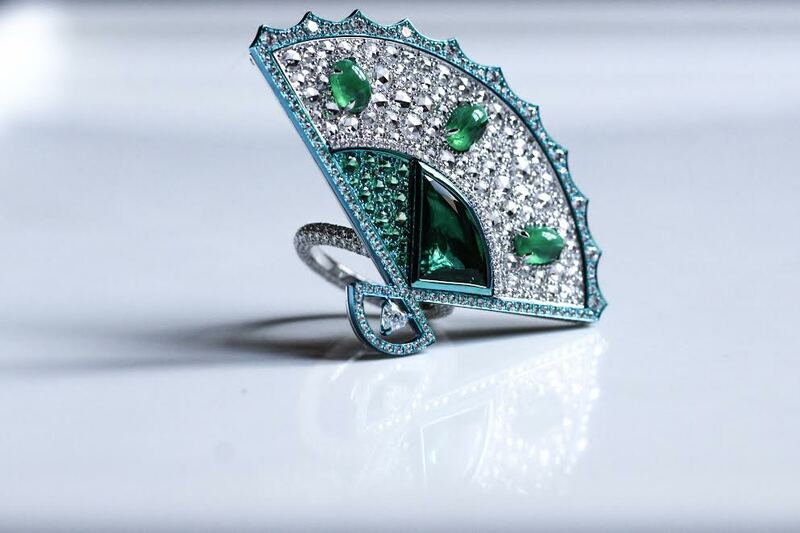 Italian jewellery house Busatti, renown for its imaginative, eclectic, unusual and amazing crafted pieces, surprises its sophisticated clientele with geometric Fan ring, totally interpreting it in the most modern way , by using fancy shape emerald alongside with cabochon emeralds, mounted on titanium, thouroughly paved with green gems and diamonds. The Fan ring surely never leave anybody indifferent and should give a thrill of pleasure every time it is looked at or worn. 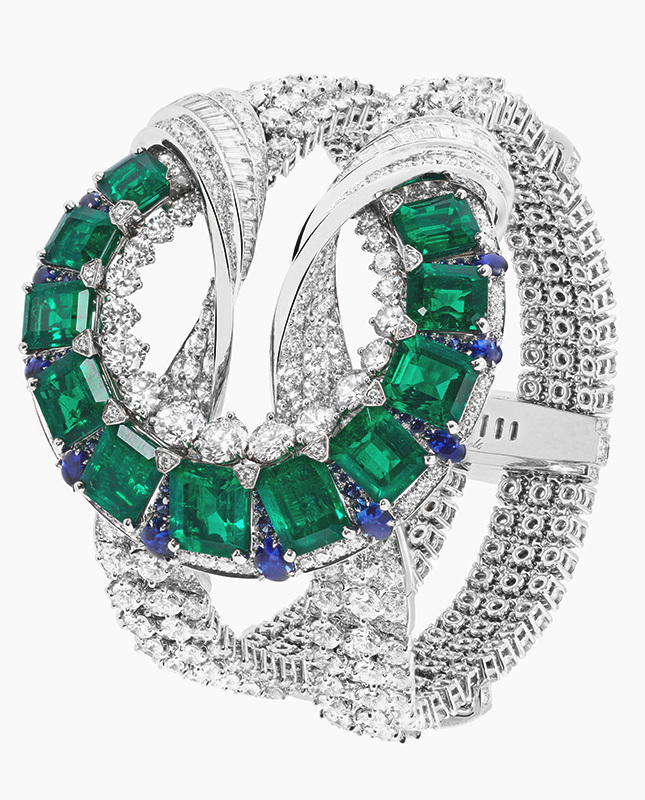 Bayco, New York based high jewellery house, accompanies almost all its beauties with impressive precious gems, and emeralds are no exception. ‘Pristine” emerald ring is an excellent example of timeless jewel with everlasting allure, complementing unique cushion cut gem with two rows of dazzling pear shape diamonds. Undoubtedly dreamlike Bayco ring will harmonize with the essence of a woman celebrating her elegance and sensuality. Van Cleef&Arpels Liens Antiques bracelet from the refined “Emeraude en Majeste” high jewellery collection, unveiled last year at Haute Couture in Paris, evokes an ancient motif of Herculean knot, symbolizing union in mythology. The bracelet is meticulously handcrafted in a very elegant and contemporary way. Carefully selected octagonal emeralds gently occupy the central arc of the piece, alternating deep blue cabochon sapphires harmoniously underline the intense colour of emeralds. The baguette cut and round cut diamonds illuminate the bracelet which is an exquisite example of the Maison’s excellence and virtuosity. “Dior a Versailles” High Jewellery collection, showcsed last year during Paris Haute Couture, delighted the eyes of connoisseurs and jewellery aficionados. Victoire de Castellane, creative mind of Dior, undeniably refers it to mystery and luxuriousness of the most sumptuous french palace in the candlelight, Versailles. 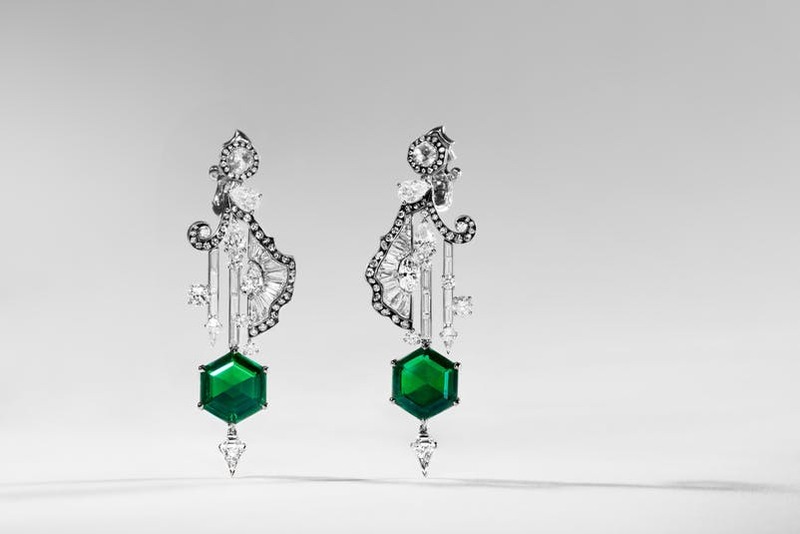 Deep green hexagonal shape emeralds, are delicately hanged out of the elegant architectural construction of “Salon de Mars baguette” earrings, entirely paved with diamonds, demonstrating theatrality and grandeur. Superb and precious jewels, a magnificent obsession of emeralds, authentic green beauty.